Data showed on Thursday that new U.S. jobless claims marked a nine-month high last week, clinic and Mid-Atlantic manufacturing shrank in August for the first time in more than a year, help deepening worries about the fragile U.S. economic recovery. Meanwhile, safe-haven assets, such as government bonds, the yen and the Swiss francs benefited. Against the Japanese currency, the greenback fell to near a 15-year low of 84.72 yen the previous day, when two-year U.S. Treasury yields hit an all-time low. The dollar/yen rate has a high correlation with U.S. and Japanese government bond yield spreads, which are now narrowing. But the dollar has managed to rise above the psychologically key 85.00 yen level thanks to trader caution about possible intervention by Japanese authorities. “Save-haven demand dominates financial markets, once again,” said Tsutomu Soma, senior manager of the foreign securities department at Okasan Securities. In early Asian trade, the dollar was down 0.2 percent from late U.S. trade at 85.25 yen. Against the Swiss franc, the U.S. currency edged up 0.1 percent to 1.0323 franc, having struck a seven-month low of 1.0257 franc on Thursday. 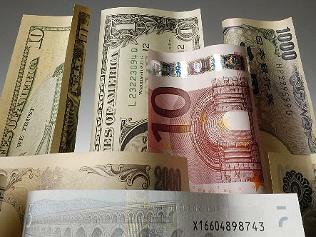 The euro was down 0.1 percent at $1.2807 after falling as low as $1.2772 on trading platform EBS on Thursday. Support comes in at the 100-day moving average around $1.2770. The euro fell 0.3 percent to 109.16 yen, with support at 109.07 yen, a seven-week low hit earlier this week, and 109.00 yen. Falling below 109.00 yen will open the way for a slide toward an 8- year low of 107.30 yen reached in late June, traders said.